David Bailiff hired as 20th head football coach at Texas A&M University-Commerce. 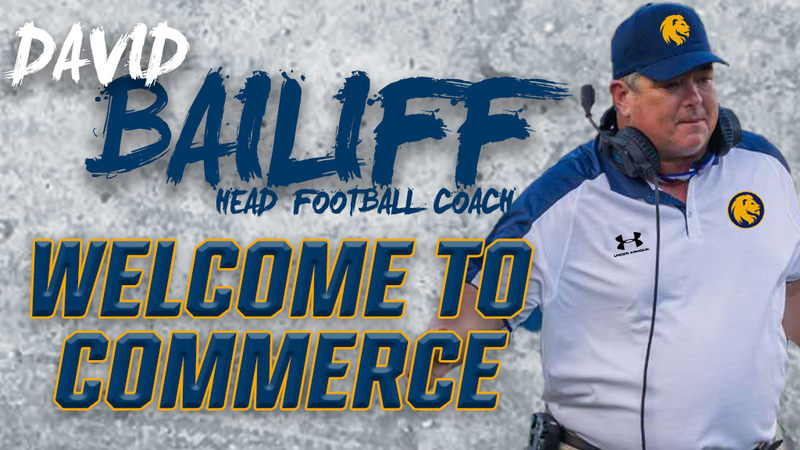 COMMERCE – Texas A&M University-Commerce has hired David Bailiff as its 20th head football coach, as announced Sunday by University President Dr. Mark Rudin and director of athletics Tim McMurray. Bailiff will officially be introduced as the Lions’ head coach at a pair of events on Wednesday, December 12. At 11:00 a.m., Bailiff will meet with Dallas-area media and constituents at McKinney ISD Stadium, site of the NCAA Division II National Championship Game. At 3:00 p.m., Bailiff will be introduced to the Commerce community with an event in the Sam Rayburn Student Center. Bailiff was the head coach at Texas State University from 2004-06 and at Rice University from 2007-17. The Lions’ 2019 season will be Bailiff’s 15th season as a collegiate head coach. In his tenure as a collegiate head coach, Bailiff has led a team to the NCAA Division I National Semifinals and has made five total postseason appearances with a 5-2 postseason record. The 2005 Texas State Bobcats were Division I National Semifinalists, and Bailiff led the Rice Owls to four bowls with a 3-1 record in those games. Bailiff has led teams to 10-win seasons in three seasons (one at Texas State, two at Rice). Under his watch, the Owls had the most wins in school history over a two (18), three (25), and four (30) year periods. Rice’s 18-9 mark from 2013-14 was the second-best of any FBS program in Texas. Bailiff was twice honored by his peers as Conference USA Coach of the Year (2008 & 2013) and led the Owls to their first outright conference championship in 56 years in 2013. His Southland Conference championship at Texas State in 2005 was the Bobcats’ first conference title in their 21 years as a Division I school at the time. While reaching new heights on the field, Bailiff’s Rice teams excelled in the classroom while also making a profound impact on the Houston community. Twice in his tenure, the Owls were honored by the American Football Coaches Association with its Academic Achievement Award, having posted a 100 percent graduation rate. Rice led Conference USA football teams in GPA in seven of his first 10 seasons and annually dominated Texas on the conference in the NCAA’s annual graduation rate studies. He was honored with the Greater Houston Football Coaches Association’s John Kelley Distinguished Service Award and by the Conference USA Student-Athlete Advisory Committee (SAAC) Coaches Choice Award winner for 2011-12. He was also cited by the Houston Press as “Houston’s Best Sports Role Model” in its 2013 Best of Houston edition. Rice had eight players taken in the NFL Draft during Bailiff’s tenure, matching the output of the previous 22 years before his arrival. In 2005 at Texas State, Bailiff was named the American Football Coaches Association’s Region 5 Coach of the Year and finished third in the voting for the Eddie Robinson Award presented annually to the top coach in Division I-AA. “What was amazing was when I met President Rudin – and I’ve known Tim McMurray for a long time – I saw a lot of vision, energy, and creativity, and then I saw the town of Commerce. Commerce has similarities to where I went to college at Southwest Texas State. The university is a little bigger than the town, the campus is absolutely gorgeous, the facilities are very impressive, and I know we’re going to build a new locker room. Then you see the downtown area being revitalized, it looks like an area of great potential. The university’s growing, the town’s growing, and I want to be a part of that community, and I absolutely cannot wait to get there,” Bailiff added. Before being named Texas State head coach, Bailiff spent three seasons on the staff at TCU. He served as the Horned Frogs’ defensive coordinator in both 2002 and 2003 while working with the team’s defensive linemen. He began his coaching career as the defensive line coach at New Braunfels High School (1982-84). He went into the private business from 1984-88 before returning to the coaching ranks as a defensive graduate assistant coach at Texas State in 1988. He was elevated to the Bobcats’ defensive line coach in 1989. Bailiff left Texas State in 1992 for an assistant coaching position at New Mexico. He returned to Texas State in 1997 as defensive coordinator and added assistant head coach responsibilities to his role in 1999. In 1999, Bailiff was selected the NCAA Division I-AA Assistant Coach of the Year by the American Football Coaches Association. While at TCU, Bailiff was also honored as the Top Assistant Football Coach by the All-American Football Foundation following the Horned Frogs’ 2002 season. As a player, Bailiff was named All-Lone Star Conference as well as All-America honorable mention while playing at Southwest Texas State from 1977-80. He served as a team captain in 1980 and was named honorable mention to the Lone Star Team of the Decade. Bailiff is married to the former Angie Daniels of Versailles, Mo. He has a daughter, Brooke and the couple has twin sons, Grayson and Gregory. Deposits for 2019 Lion Football season tickets are currently being accepted for $25. Lion fans who place a deposit through Sunday, December 16, will be entered for a chance to win a dinner with David Bailiff, the 20th head coach of Lion Football. COMMERCE – The Texas A&M University-Commerce men’s basketball team led wire to wire in an 83-61 victory over Dallas Baptist in the Field House on Thursday night. With the victory, the Lions head into the holiday break with a 9-2 record, while DBU is now 7-3. The Lions are away from the court competitively until Sunday, December 30, when they host Texas A&M International at 4:00 p.m.
– The Lions shot 56.9 percent (33-of-58) from the field, including a blistering 54.2 percent (13-of-24) from the land of three. – A&M-Commerce blocked a season-high nine shots and had assists on 22 of 33 made baskets. The Lions also had a massive 38-25 rebounding advantage. – Reggie Reid (Harlem, Ga.) had a fantastic all-around game, scoring 19 points, grabbing eight rebounds, and passing out eight assists. – Trey Conrod (Kilgore) had 16 points and six rebounds, making all three of the three-point field goals he attempted. – Willie Rooks (Houston – North Forest) also netted 16 points and grabbed five assists. – Tyree Robinson (Fall River, Mass.) scored 12 points on 6-of-8 shooting, blocking two shots, and getting four rebounds. – Rodney Brown (Beaumont – West Brook) blocked four shots and had three assists to go with six points off the bench. Reid scored on a floater in the paint on the first possession of the game, and the Lions made their first four shots of the game to run out to a 10-3 lead quickly. Two of the buckets were Conrod triples. The Patriots used three-pointers from Conner Lidiak to keep the game tight, as the Lions led 22-21 at the 10:33 mark. The Lion lead was still only at one point with just under four minutes to play, then used the long ball and a monster slam to pull away. Rooks made a pair of threes, Srdan Budimir (Karadjordjevo, Serbia) netted a triple, and Brown rattled the rim with a two-hand jam. Reid drained a three-pointer just before time expired, as A&M-Commerce closed the half on a 14-2 run to take a 45-32 lead into the locker room at halftime. In the early stages of the second half, the Lions pushed the lead to 20 points for the first time in the game with a 12-5 run in the first five minutes. 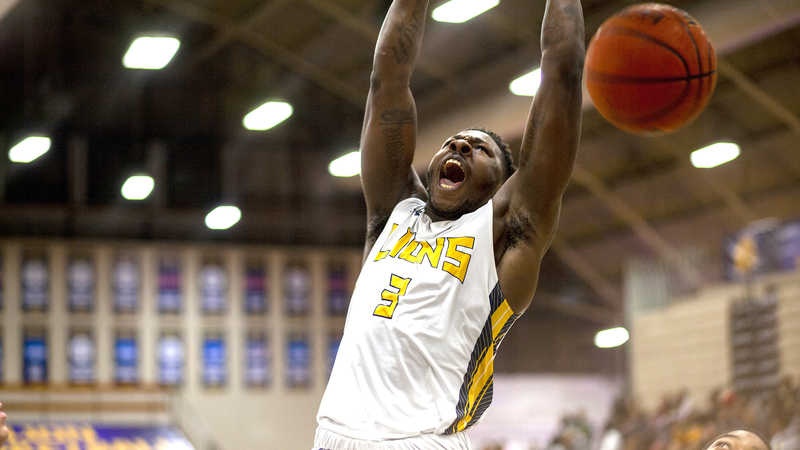 Conrod opened the scoring with a jumper in the paint, Robinson hammered home a dunk followed by a second-chance basket, then Reid drained a pair of threes to give the Lions a 57-37 lead with 15:11 left in the game. DBU managed to narrow the deficit to 13 points in the next four minutes, but the Lions then went on a 14-6 surge over six minutes. A Rooks three followed by a Conrod triple on the fastbreak put the Lions up 75-54 with five minutes on the clock, effectively sealing the game.